Amidst the chaos, this blog turned six. Yes. Six years ago over a few bevvies, a drunken conversation and the back-of-a-beermat sketch, the idea was born. I would write about the food I love and the life I live. In the vain hope that I might inspire someone to try their hand at proper Indian cooking, in between the craziness of life. Life was different in many ways then. Married, but with no kids. Work, with all the time to relax after. I braved each pan of sizzling cumin, burnt aubergine and mis-shapen roti with vengeance and a gin and slimline. By now I should technically be on top of the world. A semi-expert in the art of decidedly idiot-proof Indian cooking. So I decided to take a stab at making Sandesh, a Bengali smooth cheese sweet that just melts in the mouth pronounced Shon-Dashe. Normally, you would make your own paneer and then loving roll, gently saute and fashion these. In the spirit of this blog, I bought three packs of paneer instead. First pack, I overcooked to death. Which resulted in what was meant to be Makha Sandesh, turn into sweet shavings of plastic. That then got binned post haste. The second pack, I didn’t quite cook enough. Which made me wonder what the hell I was doing trying to make Sandesh at home anyway. So I stuck the whole lot into evaporated milk and created a cheat’s version of Channar Payesh instead, a decadent paneer-based dessert that would be a perfect ending to an Indian feast. I spooned it into little bowls and mini Basu decorated them with sprinkles of cardamom powder and almonds. The third pack of paneer will be turned into a weekday meal that can be scooped up with store bought rotis! Some things will never change, although some things irrevocably have. Thank you for being a part of this wonderful journey. Finely puree the paneer with the caster sugar. Shell the green cardamoms and powder the seeds using a coffee grinder or a pestle and mortar. Warm the evaporated milk in a medium saucepan on a medium heat, stirring briskly for about 10 minutes. Take the pot off the flame, and mix in the sweetened paneer. Cook the entire lot for another 10 minutes. Then spoon into little bowls. 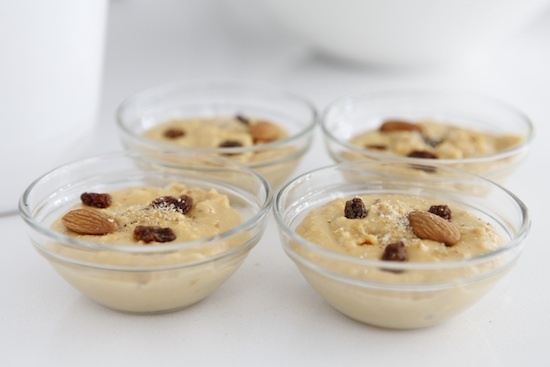 Decorate with a pinch of cardamom, the almonds and raisins, as you like it. This dessert will thicken as it cools so don’t worry about it being a bit watery initially. Even when rock hard (I left mine out overnight by mistake), it turns into a delicious fudgy sweet. Sandesh? Not quite! That is nice and easy! I have found you only recently and still I feel inspired, talk about 6 years of reading! Great work. Happy to have been part of this lovely and tasteful journey. Here’s wishing you many more to come. Happy 6th and every Mom needs a dozen cheat recipes or more. Loved it.